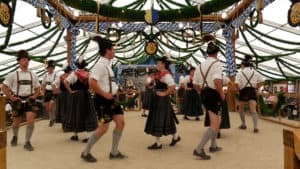 The Erdinger Oktoberfest opened yesterday and is running until the 28 October 2018. It’s being hosted in the Queen Elizabeth Olympic Park. Munich’s most famous bands from the Oktoberfest are playing live on the main stage there so be ready for the table dancing. Also, the waitresses are flown in from Germany. So they will be traditionally dressed in Lederhosen and Dirndls while them serving around 10 steins at a time. For sure there will be also a traditionally outdoor beer garden and a fun fair. There are different entry tickets from £5-£32 available. So if you only want to go to the beer garden and the fun fair it’ll be £5, the entry to the beer tent is from £15-£17 and if you wish a reserved seating you going to pay £20-£32. This could be the perfect activity for our students living near by our Bethnal Green residence or even its just 15 minutes away from Aldgate. One of London’s best rooftop bars Skylight has said goodbye to the summer and hello to the autumn as they change their focus to the harvest season. They sell now world beers and ciders instead of the limited-edition summer cocktails. Also, the Croquet and Pétanque are have been replaced with new seasonal games like Horseshoes and Pumpkin Draughts. You can as well enjoy there warming autumnal spices with ingredients like apple and pear. The Skylight is 15 minutes’ walk away from the Tower Hill tube station or 5 minutes’ walk from Shadwell Wapping Overground station. So it’s also something really close to our Aldgate residence. If you want to have a different cinema experience than the usual one you should go to this event. The Royal Albert Hall celebrates this weekend the Festival of Film. They showing movies and a live symphony orchestra going to play the movie music. So this weekend you can watch Jurassic Park in Concert. In the afternoon you can have tea with live opera there. The Film Festival will be until the 2nd of November 2018. 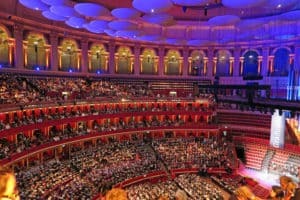 The Royal Albert Hall is a 10 minutes’ walk away from South Kensington and High Street Kensington underground stations. Also, a 10 minutes’ walk away is our Gloucester Road residence.